Three years later to the day, Kenny Rogers hurled Major League Baseball's 14th perfect game. 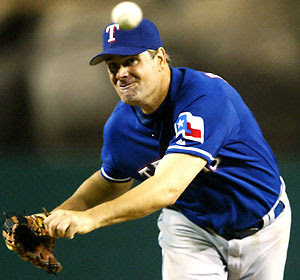 In doing so, he also returned the favor to the California Angels, who behind Mike Witt had bestowed a perfect game on the Rangers 10 years earlier. In this game, apparently Rogers "knew when to hold 'em, knew when to fold 'em" as he kept the Angels off balance all evening. The Rangers' left-hander cruised along for eight innings, striking out eight in the process. He faced a large scare leading off the ninth, when Rex Hudler lined a ball to right-center. Center fielder Rusty Greer got a good break to track it down and then made a spectacular diving catch to keep the gem alive. Two outs later, Greer clutched the final out on a "can of corn" to center to put Rogers in the history books. Rogers finished his career with a 219-156 record, retiring after the 2008 season. The athletic pitcher won five Gold Glove Awards and made four trips to the All-Star game.